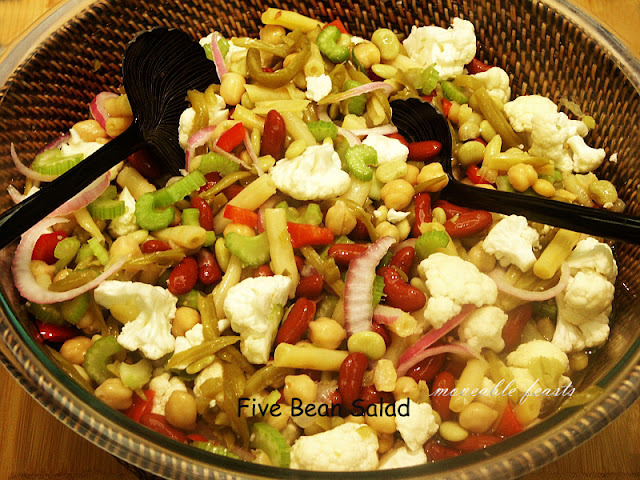 F: Five Bean Salad: Brought by me! Do you remember this one? It was standard picnic fare when I was a child. Every once in a while when I'm asked to bring a salad to feed a crowd, I turn to this old standby. With Mother's old recipe, you can take short cuts and use some canned veggies. But to keep things fresh, you can make nearly the entire thing with lovely crisp vegetables. I personally use canned kidney and garbanzo beans, but use fresh yellow and green beans, quickly steamed. I use frozen limas, but par boil and cool them. Sometimes I add a carrot, or radishes...odds and ends of whatever's left in the vegetable bin. You can also add other kinds of beans like black or cannellini beans, but I am posting Mother's original recipe, cans and all; tweak it any way you like. It all depends on how much of a hurry you're in. Note: This has to be made a day ahead. Combine vinegar, water, sugar and salt and heat to dissolve sugar. Set aside to cool. Place all the beans in a colander to drain the liquids and then place in large bowl. Add celery, onions and green pepper and cauliflower. Mix. Pour the dressing over the vegetables. Push the split garlic down in the marinade. Refrigerate for at least 24 hours, stirring several times. Check with Louise at Months of Edible Celebrations for the rest of the picnic recipes! There's still time to join the fun. Great BBQ's, family, children running around with sparklers and tables loaded with food is how I remember most of the Independence Day celebrations in our family...and the magnificent fireworks as we all lay back on our blankets. I bet most of us will be having picnics on the 4th...and while strawberry shortcake is what my mother made most often for dessert on the 4th, as kids we all preferred ice cream cones or popsicles. Because I'm still a kid at heart, I found a frozen dessert recipe that's made with fruit and yogurt. It's a favorite of mine because it has sweetened condensed milk as an ingredient. Has to be fabulous, right? Did I mention there are marshmallows? Yep, those too. You want to make this at least a day ahead. 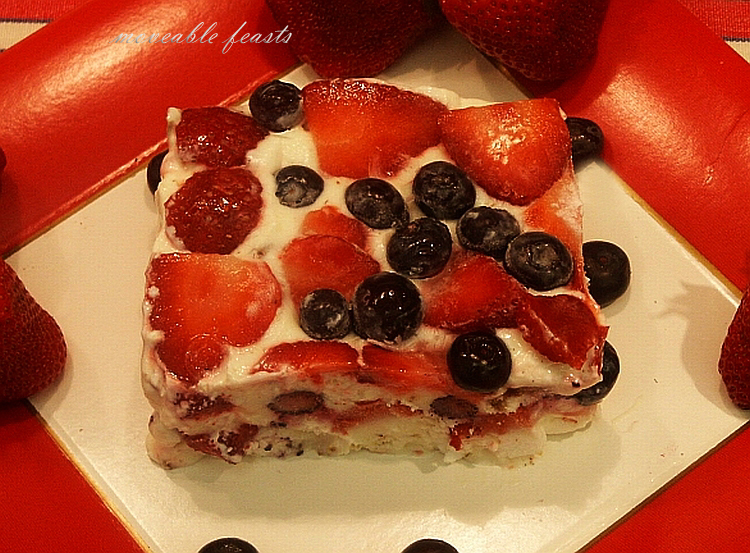 It's a quickie dessert with red, white and blue ingredients for a Happy Birthday to America! Combine the condensed milk, lemon juice and rind and mix well. Stir in the yogurt, marshmallows and nuts. Spread half the mixture in a 9 by 13 dish. Put half the strawberries and half the blueberries on top. Pour the other half of the yogurt mixture on top and use the remaining fruit on top, pushing them in slightly. Remove from freezer about 10 minutes before you're ready to cut and serve. 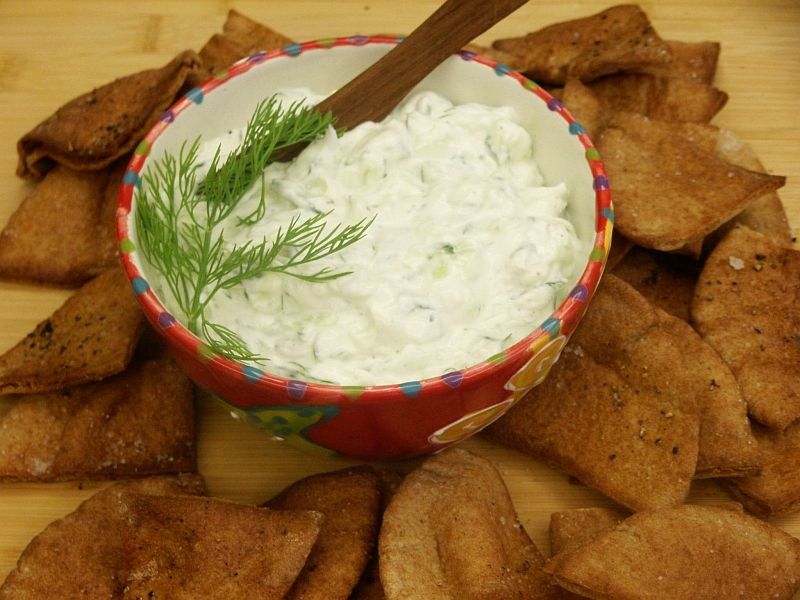 Do you have a favorite recipe for Tzatziki? Every time I make it I am amazed at how good it is and wonder why I don't make it more often. It's so simple. And with our grills in full swing, we couldn't have a more flavorful accompaniment. Tzatziki (pronounced tsah-ZEE-kee) is a traditional Greek dish, which can be part of a mezze platter (a selection of Greek and middle-eastern small dishes served in "mezze" portions like tapas. ), served as a condiment or used as an appetizer. I most often serve it with toasted whole wheat pita chips as an appetizer, but it's a great sauce for grilled lamb or chicken, also divine on all kinds of meat and fish burgers. Basically, the mixture combines yogurt and cucumbers with plenty of garlic and some chopped fresh herbs. English cucumbers (the kind that are shrink-wrapped at the grocery store) work best because they have few seeds, but you can use other cukes. Just be sure to slice them in half and seed them. Everyone has a different way to prepare the cucumber; I grate mine on a box grater and then twist them in a dish towel to get a little more juice out. I use Fage brand yogurt and place it in a sieve lined with gauze, over a glass bowl, covered, overnight. Please use Greek yogurt because regular yogurt will be too runny. I use both mint and dill in my Tzatziki and instead of lemon juice, I use champagne vinegar. But lemon juice is fine and what is used in most recipes. My recipe comes from my dear friend Nancy, who passed away a number of years ago. I think of her every time I make it. She loved the Greek Islands, which is where she said she got the recipe. The only change I have made over the years was adding champagne vinegar. Nancy used lemon juice. But I saw Ina Garten make it with champagne vinegar once and I tried it. I liked it even better...it was tangier. Place the yogurt in a gauze or paper towel-lined sieve. Let stand, covered, overnight in the fridge. The next morning, grate the cucumber on a box grater. Dump it in a tea towel and twist to get some of the juice out. Add to the yogurt and then add the remaining ingredients. Keep chilled until ready to serve. I serve it with pita chips. Preheat oven to 400°.Use 4 or 5 rounds of whole wheat pita, cut with scissors into triangles. Lightly brush both sides with olive oil and place on a foil-lined baking sheet. Sprinkle lightly with salt and pepper and bake in the oven until golden brown, about 8-10 minutes. Watch carefully as all ovens are different. And his father, my grandfather, made only one thing: buckwheat pancakes. Which is what this post is all about. 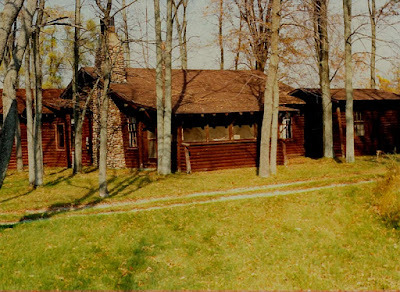 My grandfather owned some property and a cabin on Lake Huron's Saginaw Bay. It was prime wooded area with a great deal of marshland. 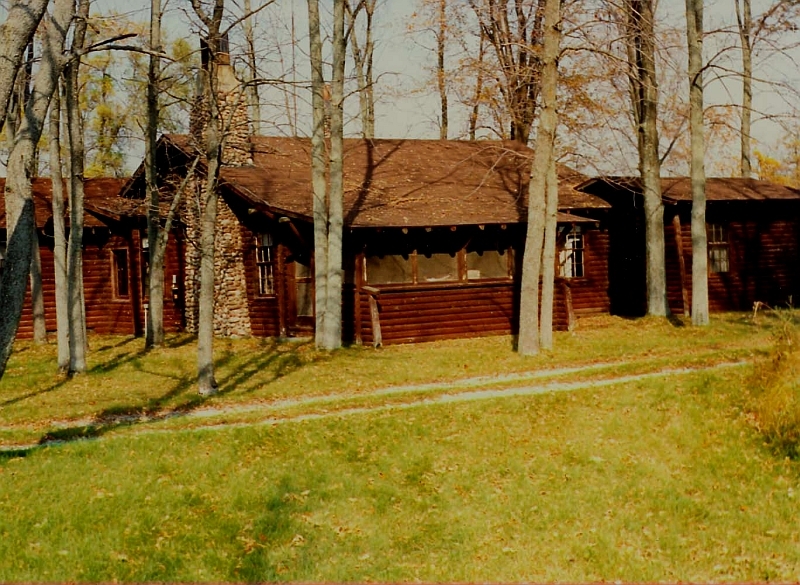 I loved visiting the cabin; it was a child's delight with its double bunk beds, all kinds of wildlife, labrador retrievers to play with, the river to explore, a small pond with plenty of fish, marshland to paddle around and acres of forest to wander in. 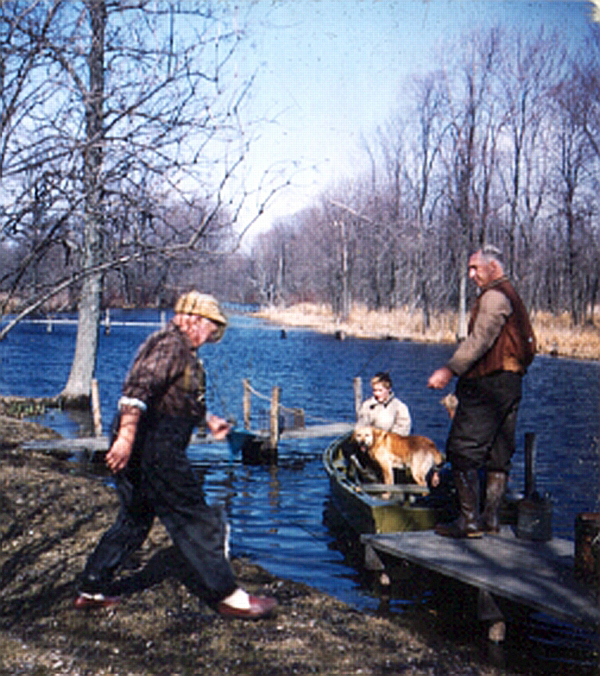 Grandpa had canoes, duck boats, small outboard boats, (in later years an air boat), to use on the Rifle River and in the marshes. He was always into some project or other, but took time to help us search for beaver and muskrat lodges, black walnuts (which my mother loved), berries and grapes to make jams and even took us frog hunting; we all learned at a really young age to skin and prepare frog legs for our dinner. My grandmother was quite an artist and she set up her easel in locations all over the property. My sister and I have some of her work, in watercolors and chalk, which we treasure greatly. 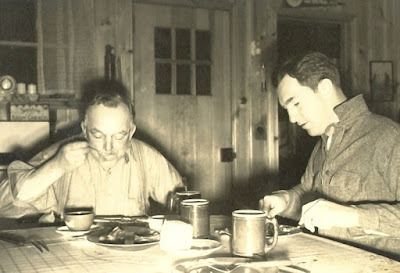 But what I remember most are my grandfather's buckwheat pancakes. 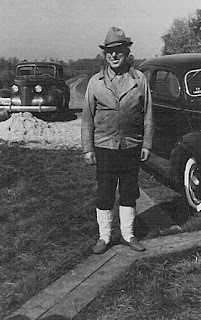 He used a starter dough and made them every morning for breakfast along with side pork. To this day, I prefer side pork to bacon anytime I have pancakes, although it's not readily available in Florida markets. And bacon and side pork are not interchangeable. 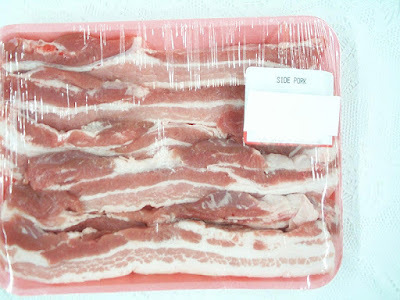 Fresh side pork is basically bacon without the curing and salt. It's thicker, takes longer to cook (sometimes we added a little water at first) and the rind is quite chewy. The aromas of side pork and bacon are entirely different. Slowly, over the years as grandpa aged, the starter dough disappeared and my Mother developed a similar pancake recipe without the starter, which grandpa used the remainder of his life. It's nearly as good as the original and Grandpa thought so too. I was really stumped on how to describe these to you so I asked my sister. The texture is not fluffy or cakey like most pancakes, but more dense. She thought I should describe them as a little like crepes, but thicker. The batter is definitely thinner than most pancake batter and the pancakes are about 5 inches across. Best to use the freshest buttermilk you can (which is a little thicker) and be sure to shake it well. 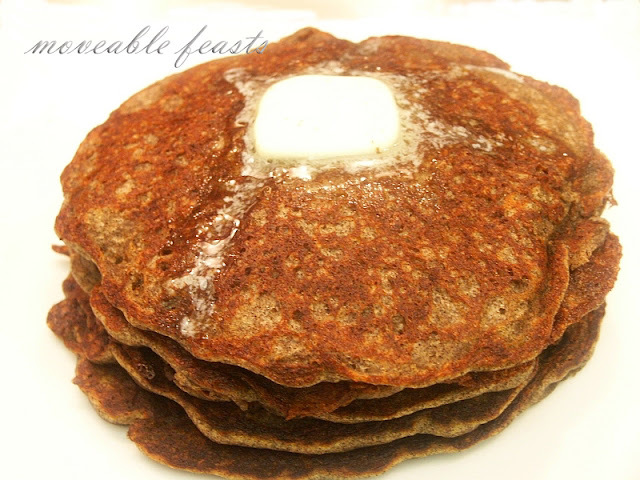 I like them with buckwheat flour, which is the way my grandfather made them, but my sister uses only all purpose flour. She is the only one of us who still makes them and usually only when she has company at her Leland cabin. I don't make them anymore either but sure am happy to chow down on hers when I visit. And I made a batch for this post. Dad always liked to put brown sugar and butter on them; I like warm Michigan maple syrup. Mix the first six ingredients. Mix the soda with the hot water and add to the flour mixture. The batter will be quite thin. Cook on an oiled pancake griddle. When you see the bubbles appear in the pancakes, it's time to flip. Cook only about 3 more minutes. The only photo I have of the three of us together. When all the berries are upon us and 4th of July is within shouting distance, I love to make a British dessert that involves no baking and makes a smashing presentation. Served with whipped cream, it has the red, white and blue we all like to see on the 4th, British dessert or not. Traditionally, it uses red currants which I can't find right now so I just chose the brightest, freshest, juiciest berries I could find. I suppose you could add some red currant jelly to the mix if you are a purist. You have to make it the day before so the bread has time to soak up all those lovely juices. It's all about the juice, you know. I've seen this in all sizes and shapes so take your pick. Squares, pie-shaped wedges, spoonfuls. Any way you want. It's an Ina Garten recipe and I did use brioche bread as she suggested. But do you know what I'm going to try the next time? Angel food cake. I think it would doubly delicious. The thing is, it's a pretty sweet dessert to start with, but still, I'm going to try it. Unless you do it first.... let me know how it turns out! 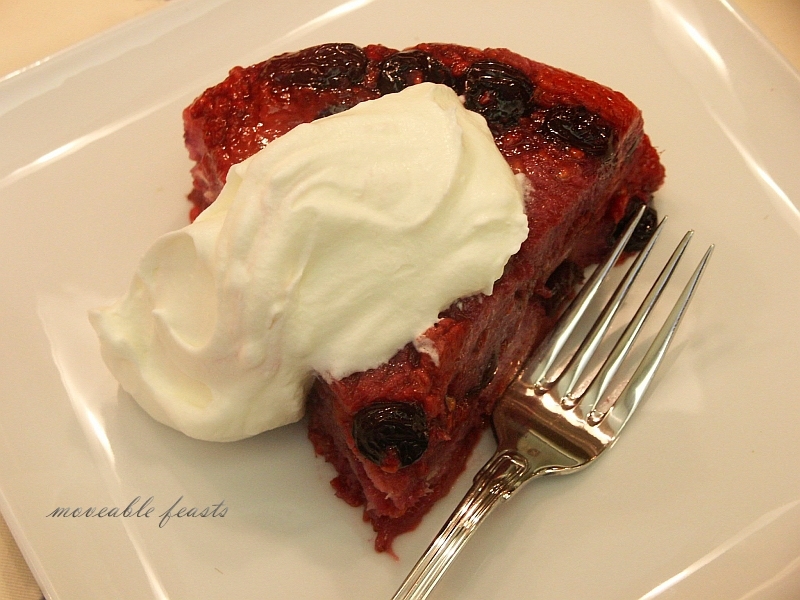 round by 3-inch high souffle or baking dish, ladle about 1/2 cup of the cooked berry mixture. Arrange slices of bread in a pattern (this will become the top when it's unmolded) and then add more berry mixture to saturate. Continue adding bread, cutting it to fit the mold, and berries. 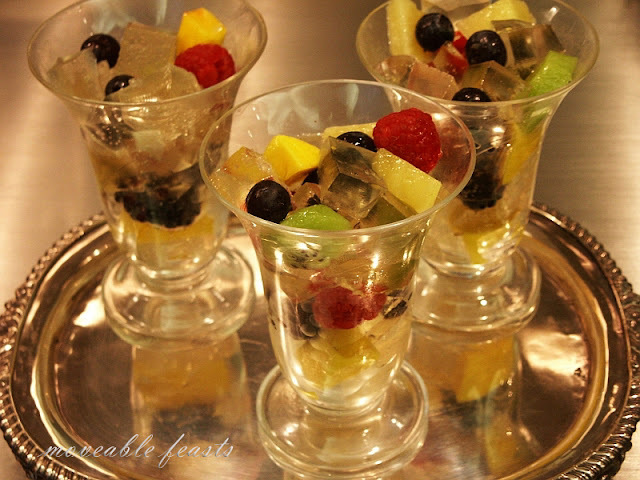 Finish with bread and cooked berries, using all of the fruit and syrup. Every once in a while one of my blog favorites mentions another blog and while checking it out, I notice some others that interest me. Happens to all of us, right? Some I find are fairly new, some aren't and you wonder why you've never run across them before. When I discovered these three last week, I was totally blown away. The first gem is Nikole at Forty-Sixth at Grace. Very minimilist layout which really appeals to me and she has an online shop I love. Thank you Lecia for steering me her way. Lots of us share Nikole's taste in her lists of "things I like" and her photographs tell the story better than words. Nikole uses words minimally as well, but you'll love the way she expresses herself. There are not tons of recipes, but when you see one, you're going to want to make it ASAP. Then I found a marvelous blog if your focus is on really healthy eating. Be sure to visit 101 Natural. Eleni's blog is brand new, beautifully done with a light and cheerful layout that makes you smile. Her photos are fabulous and her recipes are gourmet material but made with some surprising ingredients. Eleni will introduce you to lots of innovative ways to cook healthy with ingredients you may not have thought of. (I loved the Polenta-based Pizza. 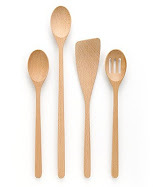 )Her dishes are so appealing, you'll want to try all sorts of new things. Great fun! I'm saving the best for last. Let me introduce you to Sprouted Kitchen. You may already know about it because Sara's blog is a year or so old and she's garnered quite a following. There's a good reason for it: you'll love her recipes AND (once again) her photographs. I was bowled over by her presentations. Sara also tends towards healthy ingredients, but not exclusively. I found her posts fun to read and am tempted to run right to the kitchen by nearly all of them. I wish I was as talented as these women and had a more professional eye with design and with a camera. Be sure to scroll down through Sara's other recipes, it's worth the time and you'll be drooling. Now how could anyone resist making a salad Sara calls Veggie Le Crunch? Certainly not me and you're going to love this salad, it's simple and delicious. In a small blender or in a bowl, mix the avocado, buttermilk, vinegar, lime, honey, hot sauce and salt and pepper to combine. The blender will make it smooth, but a bowl and whisk will still get you a dressing consistency. Use a mandoline to slice the radishes thin. ( I didn't) Cut in fourths. Peel and halve the cucumber, scoop out the seeds and dice into small pieces. In a large bowl, combine the radish, cucumber, black beans, diced pineapple and a pinch of salt and pepper. Add desired amount of fresh basil. To serve: you can put the veggie mix in a lettuce leaf and dribble dressing on top or mix the dressing with the veggies and put them in the leaf, already dressed. There's nothing simpler than making a galette. Savory or sweet, puff pastry or pie pastry, they're a delight to the eyes and a treat for the palate. I love the country look of an apple galette made with pie pastry and the elegance of a fruit galette made with puff pastry. Both are a snap to do now that we have both frozen puff pastry and packaged pie dough. Although I must be honest and say I usually make my own pie pastry, there is nothing wrong with using the packaged variety when you're in a hurry or don't want to waste the time indoors on a beautiful summer day. I made some individual galettes for a friend last week with Rainier cherries and others with black cherries using Cannelle-Vanille's recipe and her delicious sugar dough. I made a banana galette too, because I had some dough left over AND some ripe bananas on the counter. My grandmother used to make these (but she never called them by the fancy French name of galette) when she had leftover dough from a pie. I just sprinkled a little sugar and cinnamon on the bananas like she did. That brought back some sweet memories. Kids love these little "leftover" banana gems. They can pick them up like a cookie and eat them outside. So, when I had some lovely apricots left over from my apricot sorbet, I made Gourmet's Apricot Galette with frozen puff pastry. With a dollop of sweetened whipped cream or a scoop of ice cream, it's the perfect summer dessert. In a food processor pulse almonds with confectioners' sugar until finely ground. Halve and pit apricots and cut into 1/8-inch-thick wedges. On a lightly floured surface unfold pastry sheet and cut out a 9-inch round. Transfer round to a baking pan lined with parchment paper and prick pastry all over with a fork. Spoon almond mixture evenly over pastry, leaving a 1/4-inch border. Decoratively arrange apricot wedges, overlapping them, on top of almond mixture and sprinkle with granulated sugar. Bake galette in middle of oven until edges are golden brown, about 30 minutes. With a spatula transfer galette to a rack to cool. Serve with sweetened whipped cream or ice cream. The first day of summer officially begins on June 21st. As the days lengthen, the sun rises higher and higher until it seems to stand still in the sky, which is what the word solstice means: the sun stands still. The name is derived from the Latin sol (sun) and sistere (to stand still). This is considered the longest day of the year just as the winter solstice is the shortest. It's also called Midsummer because it is roughly the middle of the growing season throughout much of Europe. The day is still celebrated around the world - most notably in England at Stonehenge and Avebury, where thousands gather to welcome the sunrise on the Summer Solstice. I always think of Druids when I think of Stonehenge and the solstice, but in 1984 Stonehenge was placed under the control of English Heritage. Its first act was to ban the Druids from the site. After years of lobbying the British government for admission to their beloved circle of megaliths once again, the Druids triumphantly returned to celebrate the summer solstice on June 21, 1998. When I was a kid, we always considered Memorial Day to be the start of summer. We were allowed to go swimming for the first time, even though the water was still ice cold. We all donned bathing suits and did our best not to chicken out. Another sure sign of summer is the arrival of apricots in the produce section. Here's the thing: I want to like them, I really do. But all too often apricots just don’t taste half as good as they look. It's easy to fall in love with a stack of golden orange fruit only to get one home and discover it has no flavor. Some describe their flavor as almost musky, with a faint tartness that lies somewhere between a peach and a plum. Apricots are not juicy fruits so don't equate softness for juiciness. Choose each apricot carefully, looking for plumpness, and lots of golden orange-red color. Avoid apricots that are green or pale yellow. Finally, smell them. An apricot that has flavor also has a sweet and ready fragrance. I've been disappointed so many times; either they're too tart or they're mealy. I do keep trying though, ever hopeful and often I'm rewarded. But the main way I eat fresh apricots is in a tart or roasted with honey. Pastry Studio had a marvelous recipe last week, combining two of my favorites: roasted apricots AND a Sour Cream Ice cream. An old issue Gourmet also had a fabulous (and simple) Apricot Galette recipe made with puff pastry; I've made it often. I'm going to make good use of the short apricot season this year, starting with an idea from a former neighbor who used to make a fabulous apricot sorbet. I lost her recipe long ago, but found a nearly identical one in Gourmet magazine years later and I make it every year right around summer solstice. Preheat oven to 350°.Bring sugar, water, and dried apricots to a boil in a small saucepan over moderate heat, stirring, until sugar is dissolved. Remove from heat and let stand until apricots are softened, about 1 hour. While dried apricots are standing, place pitted, halved fresh apricots in a small roasting pan, sprinkle with a little sugar and bake in the middle of your oven until soft. It took me about 25 to 30 minutes, but the recipe calls for 1 hour. I have found by that time, the juices have all seeped out into the roasting pan. so watch them carefully. Cool in pan. Purée dried apricot mixture, roasted apricots, lemon juice, and almond extract in a blender until very smooth, 1 1/2 to 2 minutes. Force purée through a fine sieve into a bowl, pressing hard on solids and then discarding them. Chill purée, covered, until cold, at least 2 hours. Freeze in ice cream maker, then transfer to an airtight container and put in freezer to harden. 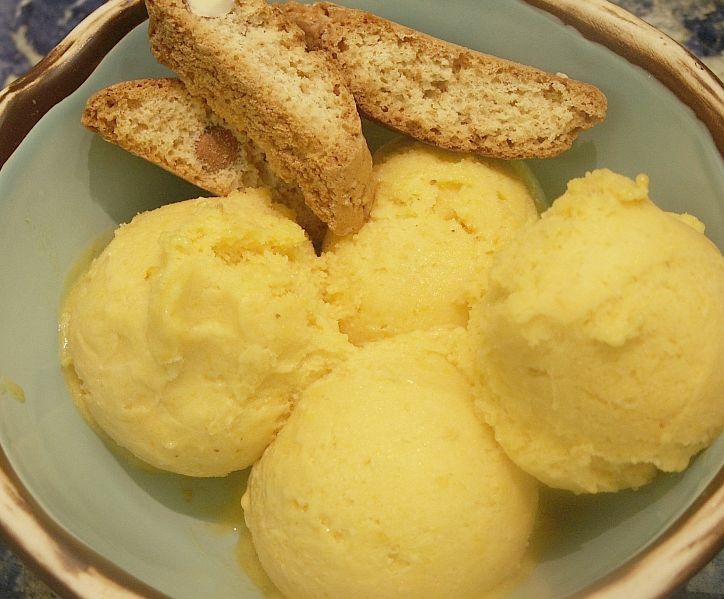 Purée can be chilled up to 8 hours. Sorbet keeps 1 week.